At the heart of the Nouvelle Aquitaine region, our brand new gite near Villefagnan is close to the beautiful towns of Ruffec, the Chateau de Verteuil and historic Angouleme. The perfect place to unwind under fabulous Charentais skies, our ground floor 2 bedroom Charente holiday accommodation sleeps up to 4 people. 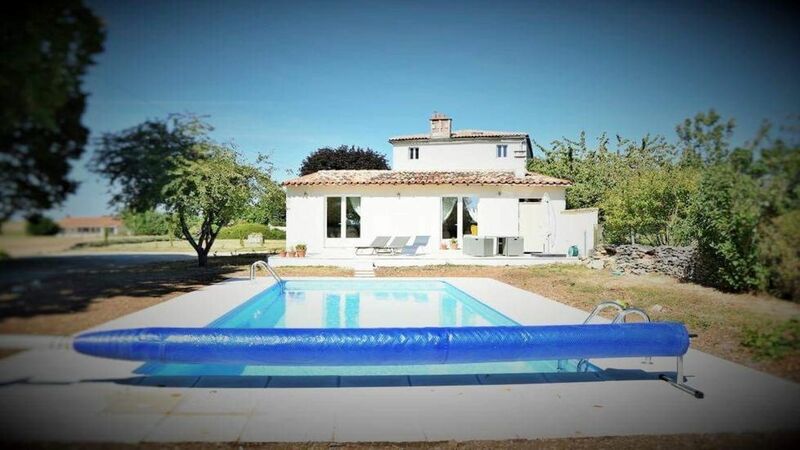 Cool off by the pool, relax in the peaceful gardens and enjoy a comfortable stay in our gorgeous, sunny new Gite. Fleur au Soleil Gite Holidays offers a relaxing French escape in the beautifully, unspoilt countryside of La Charente. Think big blue skies, open fields and quaint French villages. Set back down a quiet lane, Fleur au Soleil has access to fantastic walks and cycle routes with the nearest restaurant just a couple of km away. Our beautiful gite sleeps 4 in two bedrooms, both with ensuite facilities, walk in showers and plenty of storage.